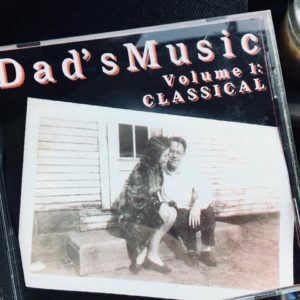 About 20 years ago, I made two discs of music my father loved. One was devoted to classical and one to popular music. I sent these sets to my mother, brother and sister with instructions that they not be opened until June 14, dad’s birthday. For the cover photos, I used a picture of my newlywed parents caught mid-canoodle. The inside picture was of the family, just as we were about to move to England. This week, I’ve been playing the classical disc while driving around and this is some extraordinary music. There are a couple pieces that some might not consider ‘classical’ – Gershwin’s ‘Rhapsody In Blue’ by the New York Philharmonic and ‘Solace’ by Scott Joplin, played by the magnificent Joshua Rifkin. This is the music my father loved and hearing this brings him back to me. 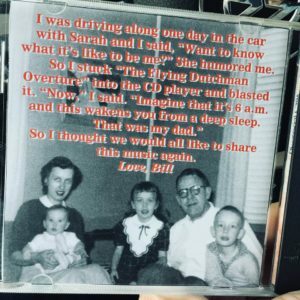 The disc starts – as so many of my childhood mornings did – with ‘The Flying Dutchman Overture.’ Dad used to blast that at 6 am to wake us for school. That particular piece of music often unfurls in my dreams. My hair stood up. To borrow a phrase from that great musician, Ry Cooder, it was chicken skin music.